This year the post is direr. Or, more hopeful depending on your disposition. Small actions are wonderful, but not enough. Mega steps are required if we want our next generations to be able to harvest food from the oceans, live in our coastal cities, and enjoy the diversity of fauna and flora that we do now. There is no Planet B. Today we see increasing extreme weather events and overwhelming scientific evidence of an anthropogenic-accelerated climate change. As designers and occupants of this amazing planet, we must take responsibility for our role in the acceleration. Other than designing for "resilience," what can be done to reverse global warming and related impacts? Get informed. Take action. Edited by Paul Hawken, and released in 2017, Drawdown and the related Project Drawdown is a beacon of hope. As stated by The Nation book review, "It will give you the best kind of hope, the kind that balances realism with radical vision." Credible, global scientists and researchers identified and modeled the "100 most substantive, existing solutions to address climate change...[and] uncovered is a path forward that can roll back global greenhouse gas emissions within thirty years." That's not the 2030 goalpost that many had hoped for, but perhaps a more realistic 2050. Blast from the past: See sustainabilty initiatives and reports from 2009. 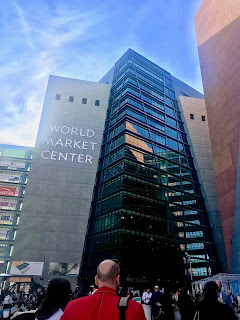 It's so exciting to know that this project is coming to the Las Vegas Community! 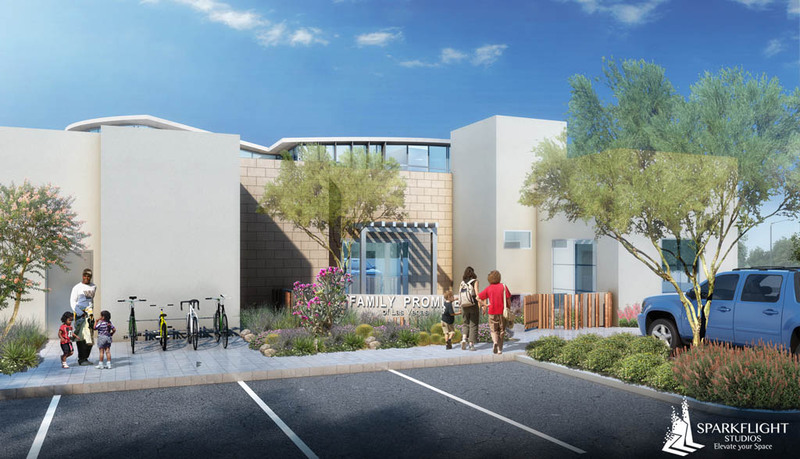 Our office has been thrilled to work with Family Promise to design their Family Navigation Center. YOU can be a part of making Las Vegas even better by contributing to Family Promise's capital campaign. Today is the #NVBigGive. What can you do to make a difference? The mission of Family Promise of Las Vegas is helping homeless families transition to permanent housing and independence. This 8,745 SF Family Navigation Center is an extension of these values by providing spaces of learning, healing, and comfort. * Facts and statistics from the Family Promise of Las Vegas website. Learn more about the national organization of Family Promise. 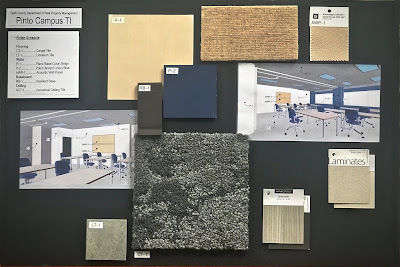 Materials board for an office tenant improvement. A materials board is not an unusual object to find in our studio. It allows our clients to visualize their space with tactile feedback. In this particular presentation, we are complimenting the existing wall colors of beige and blue (P-1 & P-2) with earth tones emphasizing yellows and grays. Because the vertical elements are mostly homogenous, we selected a carpet tile (CT-1) with a non-directional patterning that creates a “shore-like” effect. A majority of these products are sustainably sourced. Sustainability has always been an ethos of Sparkflight and selecting finish materials are an essential component of sustainable practice. For example, forbo (LT-1) is a global leader in sustainable flooring systems. Overall, they have the largest phthalate-free portfolio in the industry. Similarly, Interface (CT-1) offers sustainable products; this particular carpet tile has a 100% recycled content nylon in its yarn system and has virtually no VOCs. 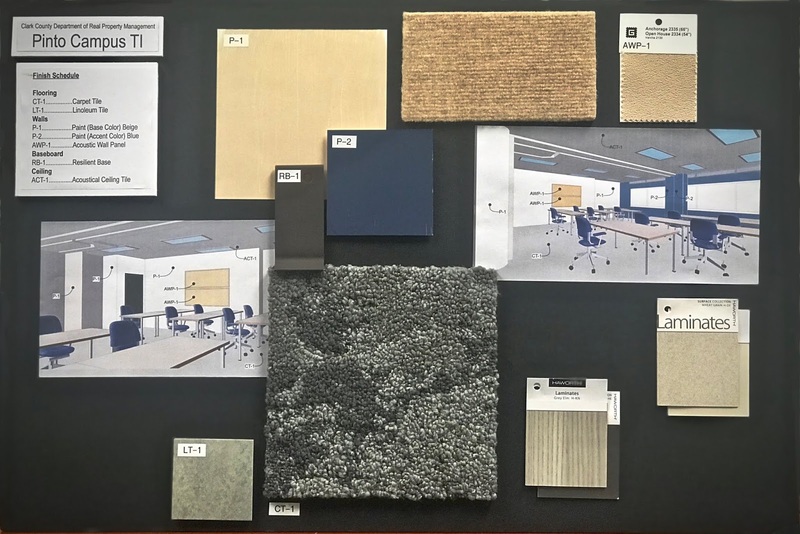 Material boards are a powerful tool because of their ability to communicate tactility, color, and pattern from an array of responsibly sourced products. Revisit the blog to see more material boards in the future! SFS Supports Fight for Healthy Lungs and Clean Air! Step, breathe in; step, breathe out. Scaling 108 flights of stairs and over 1,400 steps requires rhythm and patience. 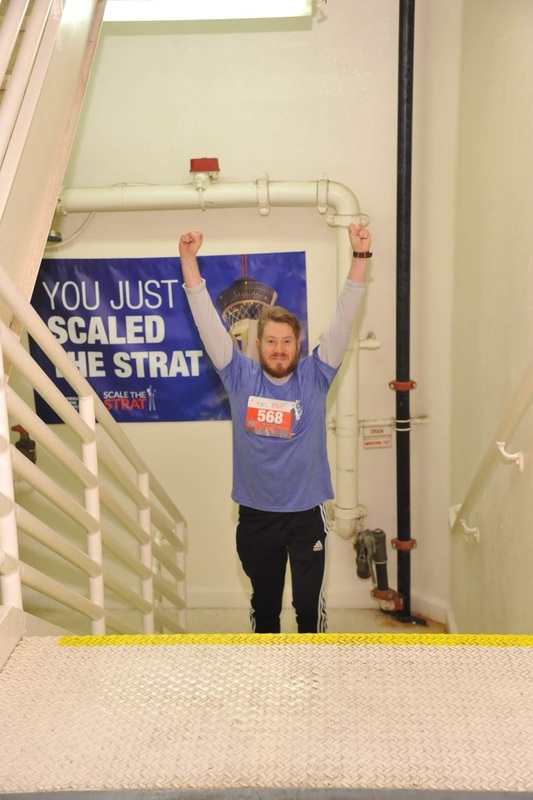 This past February our office participated in the American Lung Association’s Scale the Strat fundraiser as part of the Ninjaneers team. 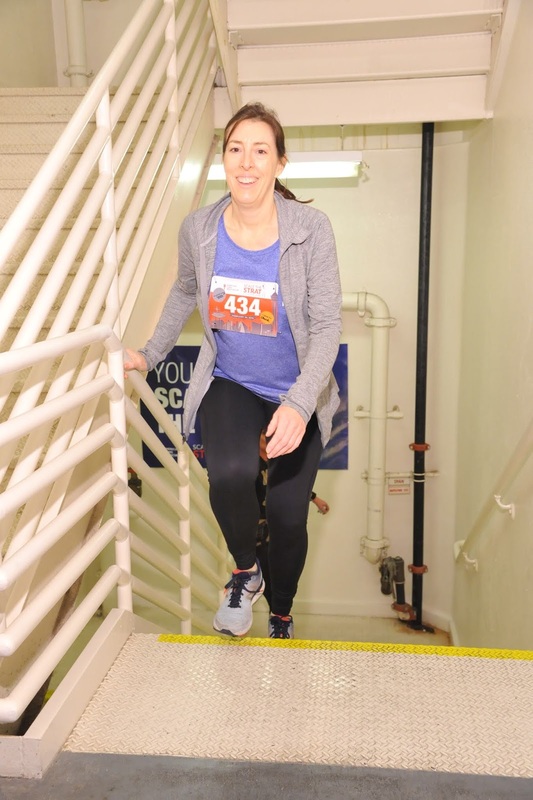 Participants climbed the stairwell of the Stratosphere to support research, patient education, and advocacy efforts. As you begin your ascent, you become aware that every step matters, no matter how small. Each increment is a small triumph. The same is true for the Lung Association: every dollar, every climb, every breath is a blessing and a gift. Sometimes we can be so focused on reaching our goal at the top that we can forget the joy of the climb. We are thankful to be a part of this important cause and look forward to doing it again next year! SFS recently had an office lunch at the Lou Ruvo Center before heading over to the World Market Center to view trends and styles in interior design. The SFS team observed several exhibits and was most excited at those that engaged the senses. 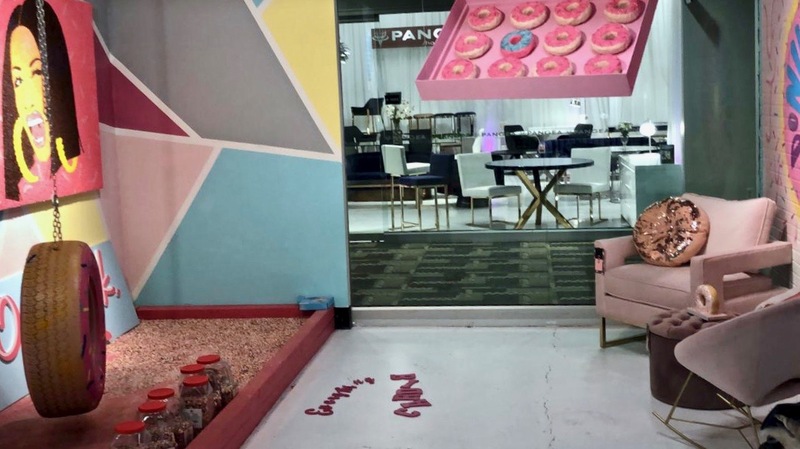 To this point, the most extreme was TŌV’s “On Fleek” showroom— complete with an ice cream stand (and complimentary rosé). TŌV was an immersive experience in tactility, bold colors, and geometry. (Yes, plenty of millennial pink too). 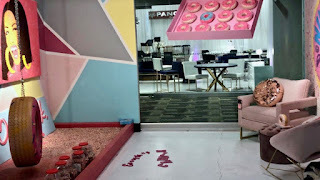 On the "Contemporary" floor there were several showrooms that allowed the team to investigate ways of combining materials and details of those mechanics: How can brass and wood connect in sleek yet architectonic ways? How can wood be used texturally? More subdued than TŌV, but still interesting was Four Hands’ showroom. Sleek design with a rustic palette defines their catalog. For example, the Judson chair is a chorale of slung leather suspended within a black iron frame. Bleached ash armrests add warmth, and a tan leather head pillow completes the ensemble. We enjoyed experiencing interiors, furniture, and architectural design converge in these showrooms. With lots of inspiration to draw from, we look forward to implementing our creative energy on future projects. With a tagline like that, you know we take client feedback seriously! "Anne’s professional knowledge and technical expertise met our expectations. Her leadership promoted a thorough and innovative approach to researching and providing appropriate design solutions during all phases of this project. Anne’s Construction Administration delivery skills were exceptional and instrumental in the overall success of this project. Anne’s team building skills and focus allowed her team to deliver timely submittals and render decisions to resolve technical challenges, which led to the overall success of the project." "I'm starting a new company and Anne is helping me in all areas from design to city permits and approval. She is very professional and responsive which is what I need for this business." "Anne Johnson, Architect played an integral role in the success of project delivery of 2 major solar - renewable projects that were funded through American Recovery and Reinvestment Act of 2009 and US Department of Energy. The successful delivery included monetary rebates, contribution to public awareness and overall happy clients." "My husband and I had a couple of issues with the County and we needed to have a site plan drawn up. ...we searched through Angie's List. We came across Anne Johnson and noticed she had received an A rating. We gave her a call. She was able to come out with another member of her crew and create a site plan for our house. Little did we know that Anne normally deals with buildings and larger sites. We give a HUGE thanks of appreciation to Anne Johnson and her team. She really came through for us with a professionally done site plan." "Anne came to the house and listened to our request for a covered patio/balcony, grill with sink, and extended room. She took the information...and got back in touch promptly. Anne was fantastic. She was prompt and very informative." "I was looking for someone with skills to help me create a work setting that was both comfortable and environmentally friendly. Others seemed to be able to focus on only one or the other. It was clear from the beginning that you could help me accomplish both." "We really appreciate your diligence with this process...The structure looks great! Thank you." "Your [feasibility consultation] report surpassed my expectations." "Quality, timeliness, consistency, and dependability are key factors for me in evaluating process and service, and your work with this project gets high marks on each of these. You worked hard to be sure I had no surprises and provided all documentation in a timely manner." “I'm getting so much enjoyment out of my new office/study…thanks for all of your help designing such a great work environment. 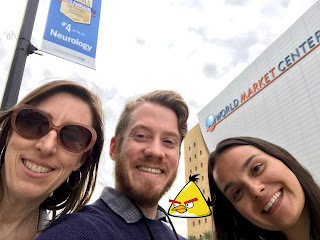 "Anne always asked our preferences and came up with ideas that matched...We feel lucky to have connected with Anne!" In honor of Memorial Day weekend, we extend our gratitude to all the heroes who gave their lives to win our freedom. The "Find Your Luck" window has been repurposed as a memorial thank you. As we see it these heroes made the luck, the good, that we enjoy today. The lucky 4-leaf clover has made a new appearance. Can you find it? An architecture and graphics studio focused on integrating sustainable practices into civic, commercial, interiors, residential, and public art projects. Services include design and consulting.